"...IHRE Klezmer-Musik ist wilder und feuriger als jemals zuvor, wobei ihre Spielweise mittlerweile viel geschickter ist..."
“...Music like strong coffee – Klezmofobia thrilled the crowd..."
In itself, the five male musicians presents a diverse mix of styles and sound, with plenty of power and explosiveness. Even with moments of madness and chaos. 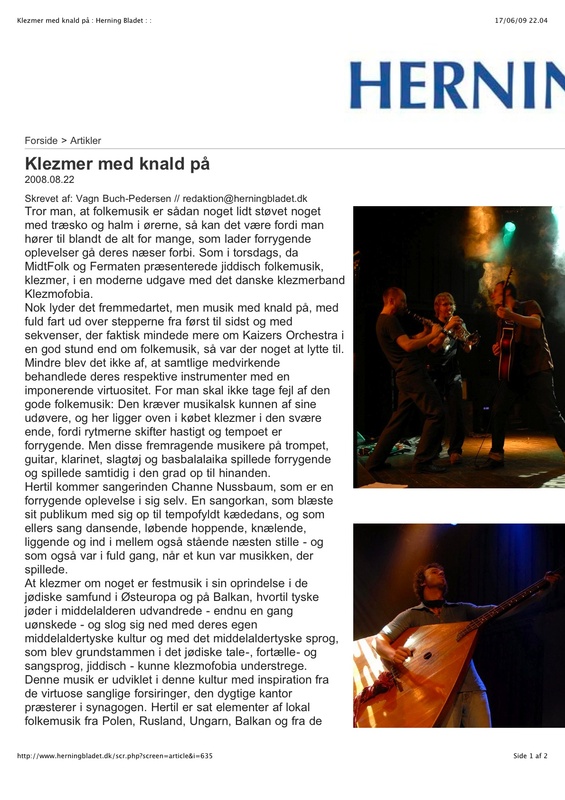 To let the old wind instruments meet surf rock guitar and heavy drums, transforms occasionally Klezmofobia into a danish-jewish response to the Norwegian Kaizers Orchestra. it sounds exotic... music with high energy, at full speed beyond the steppes from first to last second, and with sequences increasingly sounding more like Kaizers Orchestra, than folkmusic... all the musicians treated their instruments with an impressive skillfulness. Behold! there is party! - in such an extent, that in a moment of weakness you no longer only glance at the dream of living out the romantic gypsy life. 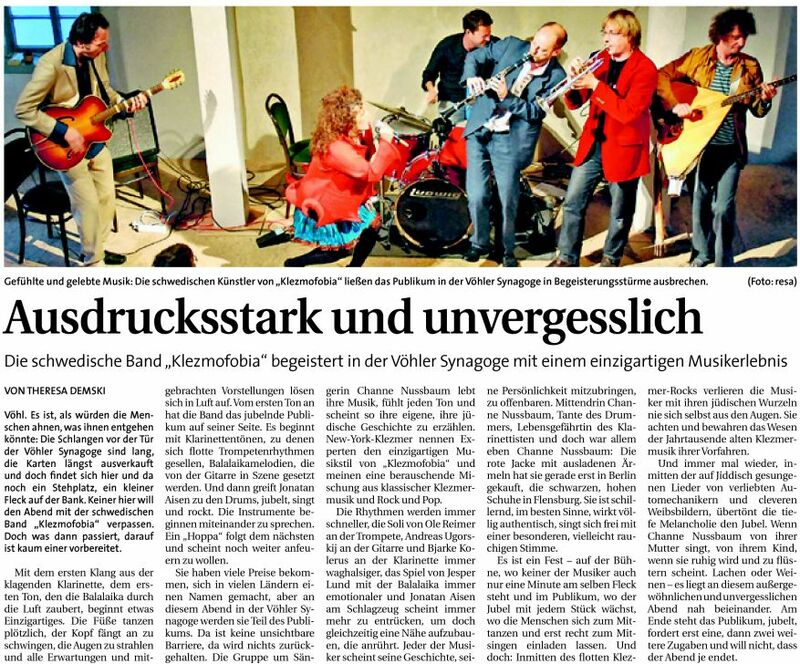 inMusic: ... eine absolut lebendige Mixtur aus Klezmer, Pop, Balkan, Surf und Rock ..
Jazzthing: .. so macht Klezmer Spaß. „Schnelle Stücke und ausgeprägte Balladen (...) belegen die Melancholie und den Tanzcharakter des Klezmer." 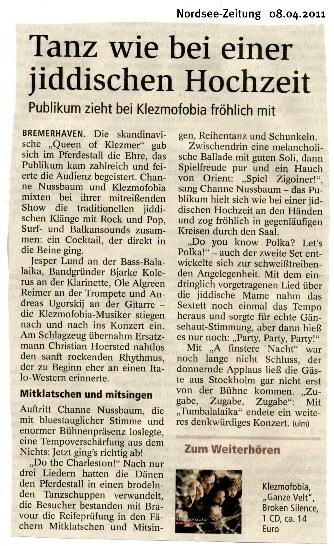 Roots Zone: Uniqe intrepetation of klezmermusic.. (august 2009). Put the music on - and then get out on the dancefloor! 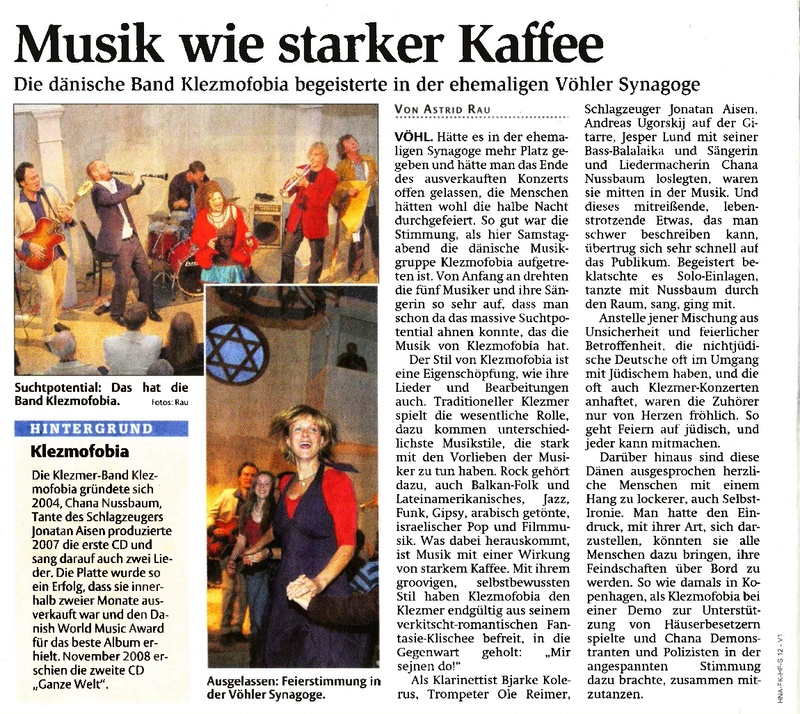 In october 2006 Klezmofobia´s debut album "Tantz!" was released. It was sold out within a few weeks, and has since then sold app. 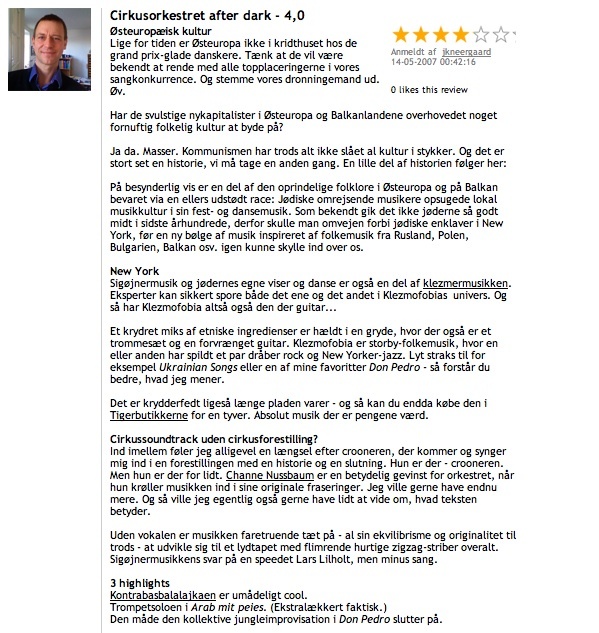 17.000 copies! 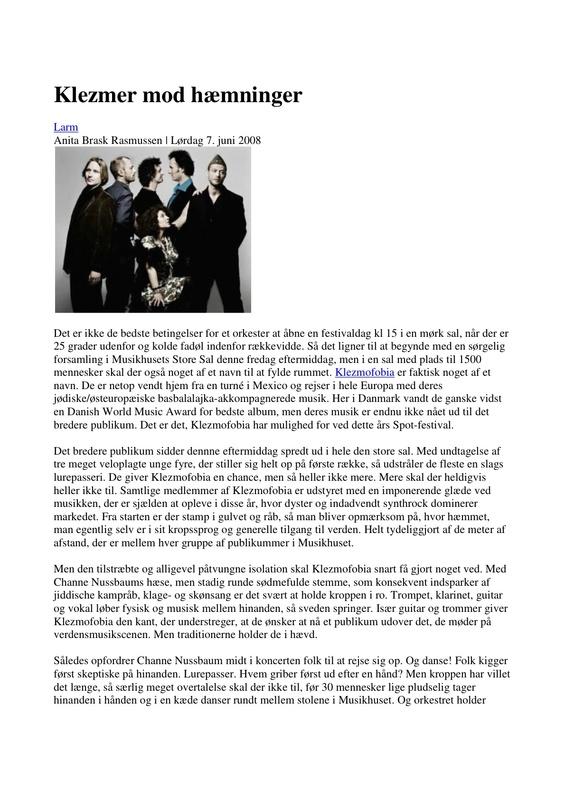 In november 2007 it was awarded with a “Danish World Music Award for best album 2007” (Grammy). ”It grooves and it has this very peculiar blend from something melancholic and a happy circus-mood which caracterizes the klezmer music.” Geiger, music-site. 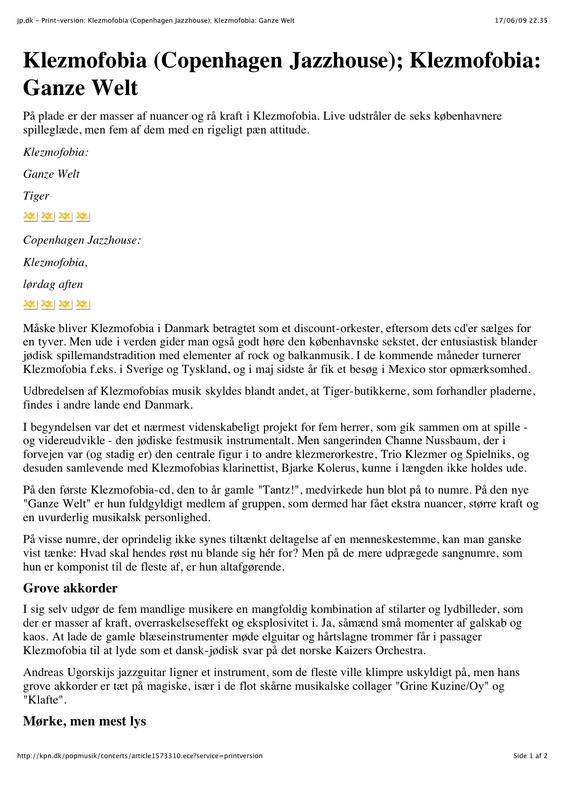 Read the whole review here (in danish). A spicy mix of ethnic ingredients is poured into a pot where there is also a drumset and a distorted guitar. Klezmofobia are metropolitan-folkmusic, where some have spilled a few drops of rock and New York jazz. Listen immediately to, for example, Ukrainian Songs or one of my favorites Don Pedro - then you better understand what I mean.